Friday, April 19, Bucharest and Transylvania meet at Subteran for an intense night of music and dance, anticipating a hot summer at which Solar Seeds Transylvania contributes with 2 marathon events. First of them, an exceptional offering, the opportunity to hear and see for the first time in Romania one of the parents of the psychedelic trance movement at Goa Gil & Ariane - Trance Dance Initiation - 24 hours; second, the annual now familiar Solar Seeds in Transylvania Gathering 2019, which will reach its 6th edition. 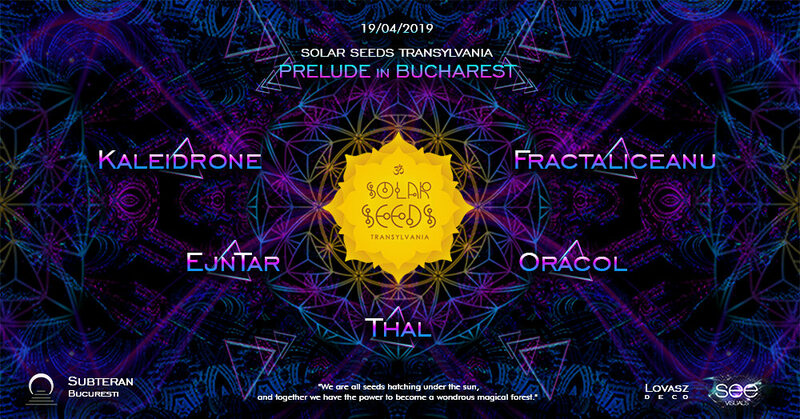 Will lure you musically Thal, Kaleidrone and EjnTar, the Transylvanian members of the Solar Seeds family from Mures, Cluj and Oradea, together with the hosts Oracol and Fractaliceanu, two representative names of the local scene. The visual frame will be taken care of by See at the projections and Lovasz at the deco.